Over 40 guests joined Nautical Institute and Institute of Chartered Shipbrokers members at a joint presentation at the Royal Hong Kong Yacht Club on the 11th October 2001. The topic was ‘X-ray container scanning equipment in use at Hong Kong’. Given the recent events in New York and Washington, and the heightened awareness of the need for security, the presentation could not have come at a better time. In fact, somewhat eerily, the initial meeting with the speaker representatives regarding the format of the presentation had taken place on the evening of September 11th 2001, some 30 minutes before the tragic events thousand of miles away in New York and Washington began to unfold. The principal speaker was Mr. Reed O. Clark, Vice President of International Sales of American Science and Equipment Ltd, a former US Navy marine engineer, who has operated ships in the United States lines fleet, and prior to joining AS & E, was a Director at APL. Reed and the Hong Kong based representatives and technical staff, gave a polished and very informative presentation. X-ray inspection technology has advanced tremendously in recent years, and the development of AS & E’s ‘ Z Backscatter’ technology, means that objects previously not visible with conventional ‘transmission x-rays’ are now more easily discernible by the system operators. Two ‘Mobile Search’ mobile vehicle and cargo inspection systems, are now in use at the Hong Kong container terminals and land border crossings. The two vehicles, costing around US$2.8 million each, have been in use in Hong Kong since August 2001, and now form the Hong Kong Customs & Excise Departments main strike force for combating trade fraud, the trafficking of drugs, and the disturbing trade in human smuggling. In the first 7 weeks of operation, 5 seizures had been recorded, involving a variety of goods including counterfeit clothing and cigarettes. A three person crew of specially trained Customs and Excise personnel operate each of the vehicles at the border crossings and container port. 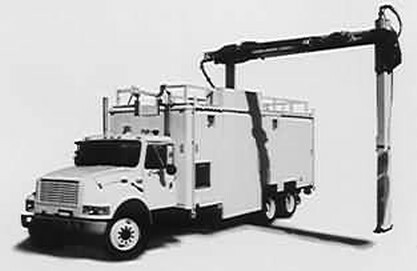 The vehicles extendable arm is deployed to one side, and the vehicle then moves alongside a stationary truck or container, and during scanning, sends an image to the monitors in the control room located within the truck. The whole examination process takes only 2 ~ 3 minutes, as opposed to the hours that may have been required previously to inspect and empty suspect shipments. The audiences’ curiosity soon took over, and questions came thick and fast throughout the presentation. These included further probing on the technical aspects of the equipment, and questions relating to the safety of the equipment. The safety of the equipment was put into perspective by Mr. Reed advising that during a normal chest x-ray a person is exposed to 200 microsieverts of radioactive energy, whilst standing at a distance of 2.2 m from the equipment when it is in operation, momentarily exposes that person to just 1.1 microsieverts. It is hoped that the territory can acquire three more of the vehicles so as to increase the coverage at the 3 border crossings and the container terminals. The event was the first to be jointly hosted with the Hong Kong branch of the Institute of Chartered Shipbrokers, and was judged to have been a great success, and a worthwhile exercise, in continuing the branches policy of liaison with other professional institutions to further promote the activities and aims of the Nautical Institute. A complimentary buffet and drinks before the event had been well received, and the Yacht Club served up some fine fare for the speakers and event organizers after the presentation.